I thought of making a chickpea dish to take to some friends who just had twin babies. Alas, they had to move our get together, so we reserved some cooked chickpeas for a future dish and made a smaller course for ourselves. While I was out today, my wife made a batch of chickpeas in the Instant Pot pressure cooker, so I had that as a starting point. I put the rinsed chickpeas back in the pressure cooker, along with the cabbage, tomatilla, turmeric, cumin, miso, and water, and cooked for 0 minutes (i.e., just let the Instant Pot come to pressure then turn off). After the cooking was done, I waited a few minutes and gently released pressure, then added the onion, lime juice, and salt. I served along with jade pearl rice. I picked up on sale some nice simmer sauces today, including a Moroccan one. I made a simple vegetable dish of tempeh, broccoli, onion, potato, and carrot cooked with the simmer sauce. The sauce packet claims to serve 7, but I think it's more like 4. Each serving has 1/2 gram of fat, so, even with larger servings, I'll describe this meal as "almost no added fat". We are having a snowy weekend with cold weather, so soup is in order. I don't usually make a straight up vegetable soup, typically including beans. I decided to make a simple vegetable soup in my Instant Pot pressure cooker. It has a "Soup" button that cooks for 30m; I was going to cook just for 20m to have firmer vegetables, but my daughter was helping me cook and wanted softer vegetables, so we stuck with 30m. 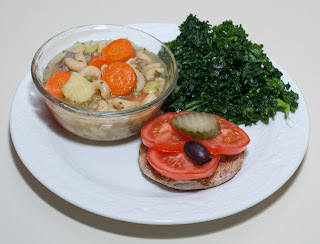 I've been meaning to make a pasta e fagioli bean and pasta soup sometime; this wasn't a bean soup, but I still used whole wheat pasta in this non-fagioli. Here is what I did. I put all of the ingredients into my Instant Pot and pushed (well, my daughter pushed!) the "Soup" button for 30m of cooking. I also served a massaged kale salad and English muffin halves with tomato, pickle, and olive. By the way, yesterday my daughter asked about fondue and I had the idea to make a simple dessert a bit like fondue. I put some frozen strawberries and mango into my small Saladmaster stock pot and cooked waterlessly (cooked on medium heat, covered, till vapor release started flapping, then reduced heat to stop the flapping noise and cooked for about 15-20m). Toward the end, I quickly opened the cover and put in a few vegan chocolate chips. It was so good that we did the same thing tonight. It tastes like a nice warm fruit compote - my family didn't even want chocolate with the fruit today. This would be really good with my vegan yogurt! Dinner was great! We all loved it. It's amazing how tasty pressure cooking makes soups. I should definitely make a pasta e fagioli sometime. The soup today was really good; I had considered adding cauliflower or broccoli, but am glad that I didn't. A little red wine would have been good, and even more garlic could have been nice. I recently bought a nice looking product, organic green lentil lasagne from Explore Cuisine and decided to make lasagne. These noodles are 50% green lentil flour, and otherwise are made of green pea four and brown rice flour. I like Rao's pasta sauces but have only bought them a few times as they are expensive. They were recently on sale, and I purchased their artichoke sauce. Here is what I did. 2 ounces tempeh cut into thin slices approx. 1/4" x 3" x 3"
In a glass baking dish, I put one noodle down and covered it with ample sauce. I repeated, with less sauce in the middle, and ample sauce again atop. In between two of the top layers I put the tempeh. I reserved three noodles. I cut the reserved noodles in half and made a version of the lasagne for my daughter, skipping the tempeh, which she doesn't like, and using a bit of Daiya brand vegan cheddar "cheese". I baked, covered, in an oven preheated to 400°F oven for 40-45 m, and then served. I also made a massaged kale salad (kale leaves torn from stems and massaged with lime juice and salt) and waterless baby lima bean and bell pepper (beans and pepper started from frozen) side dish. The sauce has a little oil in it and weighs in at 6g of fat per serving, with 6 servings in the bottle. I used maybe 5/6 of the bottle, but this served three of us, so contributed about 10g of fat per serving, so I won't claim this to be a no added fat dish, but with typical sauces that I use, it would be.